Answer: You are privileged to live in one of the few remaining dark sky areas of North America. So lacking a comparison, you might take that night sky for granted. 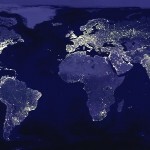 Light pollution meets the same criteria as other forms of pollution: It has a negative impact on a valuable natural resource. I’m not talking about air or water or soil … I’m talking about the sheer beauty of the natural world. 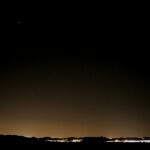 Specifically, I’m talking about a pristine view of the dark night sky. Unarguably, views of the Grand Canyon, Rocky Mountains, Crater Lake, et al. are true natural resources. Their value is not monetary, like coal or clean water. It’s purely aesthetic. These views impact human emotions, spirituality, wonder, joy, introspection, and have often inspired works of art. This was the motivation for President Woodrow Wilson’s creation of the National Park System in 1916. And although the federal EPA has not officially enacted any policies about light pollution, many state-level EPA offices have. Most of our National Parks, working with local zoning agencies, are doing the same. 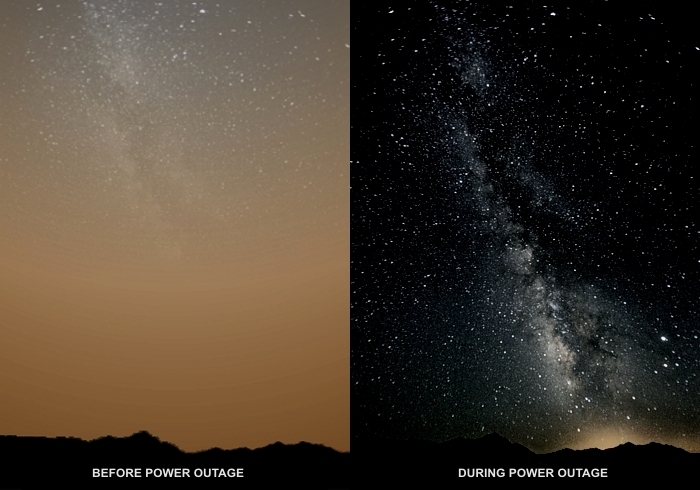 The graphic above is a simulation of how light pollution affects your view of the night sky. The left half shows how little is visible through the light dome above a major city. The right half shows that same view, but with a simulated power outage that extinguishes all but emergency lighting. The right half original was a photo by Steve Jurvetson, posted for free use with an attribution. Thank you sir. I added the light pollution in the simulated left half. Further processing resulted in what is admittedly an extreme comparison, but I really wanted to make my point graphically. I’ve seen this happen once, in August of 1996 during the Great West Coast Blackout. High demand for air conditioning during a heat wave overloaded transformers on the coast, and the effect cascaded eastward, taking out Phoenix along with 9 western states. Power was out for 4 days during our hottest month of the year — but the night sky view was pretty cool. 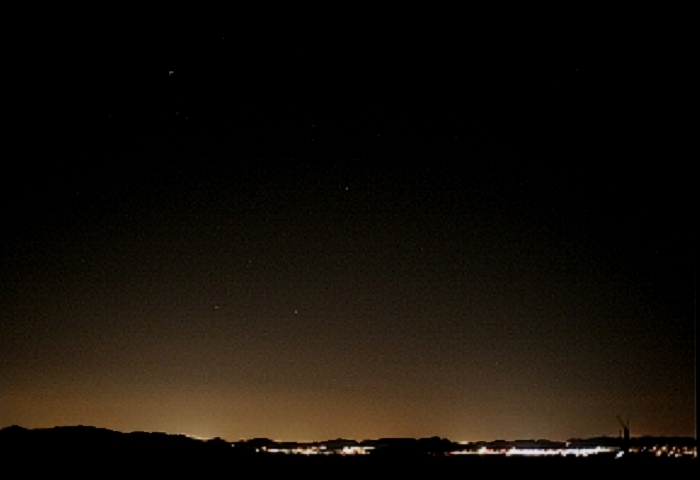 I didn’t get a photo of that, but click on the thumbnail below to see how the light dome over Phoenix normally appears. Then imagine that yellow dome of light gone, as in the simulation above. You can see an actual photo of the effect here, taken by Todd Carlson, Assistant Editor at SkyNews Magazine in Ontario. This was during the Great East Coast Blackout in August of 2003. When you look at the Earth from space, all those city lights look pretty, but the fact that you can see them at all means there’s a lot of light shining upward — light that serves no useful purpose. Click on the thumbnail below to see the light. I could also raise the issues of light pollution’s health effects, impact on ecosystems, energy waste, safety hazards, etc. But here’s a great gateway website if you want to learn more about that. Today I just wanted to focus on the aesthetics, and talk about a natural resource that too few people can experience these days. So enjoy your dark night sky up there in Montana, CB. You still have a view that many of us envy.